Are those pesky mosquitoes getting more entertainment out of your family picnic than you are? If the answer is yes, then it is time to reclaim your backyard with assistance from an unlikely partner. Nowadays, NASA is developing tools to track and predict the spread of the West Nile Virus on a global scale, but several years ago, the Space Agency carved out some time to collaborate with an outdoor products manufacturer in order to help control mosquito populations on a local level. The technology resulting from this union leveraged a space-age heat blanket to attract mosquitoes, which would then be eliminated without the use of harmful pesticides or chemicals. The Mosquito Killing System was developed with technical assistance from NASA and is an environmentally safe way to reduce the mosquito population. In 1995, Alvin Wilbanks, of Environmental Products and Research, Inc., met with Marshall Space Flight Center’s Technology Transfer Office to discuss his ideas of developing a mosquito-killing system. Wilbanks’s proposal for such a product evolved from nightly rituals of coming home from work and having to free his house of mosquitoes in order to protect his newborn daughter. He had been applying repellents to her, but was apprehensive about what could happen if she accidentally ingested them or got them in her eyes. His first theory was that the mosquito was seeking blood; he placed blood on a slide as an experiment to view the mosquito’s behavior. To his astonishment, the mosquito was not attracted to the blood sample. He then began to test other methods of attraction, such as moisture, body scents/pheromones, motion, and breathing. All of these experiments had poor results, as there were no increases in the ratio of capturing and killing the insect. Wilbanks even tried an off-the-shelf bug light, but after examining the contents, it was evident that the mosquitoes were not being drawn by this method. Without giving up on the bug light unit, Wilbanks removed the lights and replaced them with a heating element. The test revealed that most species of mosquitoes were attracted to the heat emitting from the modified unit, yet they were not being captured. He spent the next 3 years determining what temperature would be most effective and how big the unit should be in order to achieve the most efficient results. Other tests were performed to determine effectiveness, including air flow and wind design. The final analysis indicated that temperature, size, motion, and elevation were all determining factors in capturing and killing mosquitoes. Armed with these facts, Wilbanks was closing in on the development of his own mosquito-killing system. There was a delay in the process, however, as the mosquitoes were smartening up and detecting the electrical fields of Wilbanks’s experimental killing system. It turned out that the electrical fields were acting as warning signals to the insects, thus deterring them from investigating further. Wilbanks decided to alter the unit in order to conceal the electrical fields but still attract and kill the mosquitoes. This added other variables that had to be perfected before the system was ready to go to market. It was at this point when Wilbanks submitted a request for technical assistance to NASA’s Marshall facility. Marshall engineers suggested a number of improvements to cut costs and enhance the efficiency of Wilbanks’s system. The specific areas of assistance included the difficulties identified with the electrical fields and issues pertaining to the heat source. Based on these suggestions, Wilbanks decided to use a NASA-influenced heat blanket in his system. This technology simulates body heat and skin to attract the mosquitoes. Additionally, Marshall referred Wilbanks to a nonprofit agency that aided him in developing the prototype mosquito-killing system as well as the molds used to form the base and top structure of the product. satisfaction. He was granted a patent for his innovation in 1997, followed by Underwriters Laboratories (UL) approval in 1999. How the Mosquito Killing System works: 1) A photocell activates the unit at dusk and powers off at dawn. 2) A heat source mimics the body temperatures of humans, livestock, poultry, and domestic pets. 3) An automated carbon dioxide release mimics the breathing of warm-blooded animals. 4) A fan provides a vacuum source to force the mosquito through the unit. 5) An electronic grid provides an electrical charge to safely eliminate the mosquito. 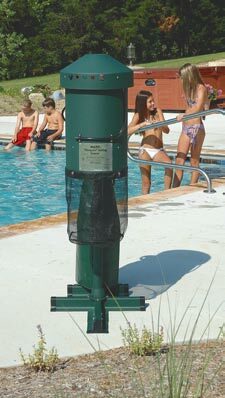 Now owned by Arctic Products, of Jefferson City, Missouri, the Mosquito Killing System utilizes the unique heating source inspired by NASA, along with carbon dioxide, to lure mosquitoes within a 1-acre radius. Since mosquitoes’ natural “hunting” techniques involve heat sensing and carbon dioxide detection, the Mosquito Killing System employs heat and the carbon dioxide to mimic body temperatures and breathing patterns of humans, livestock, poultry, and domestic pets. Every 6 to 9 minutes, the killing system cycles through various temperatures and releases carbon dioxide to attract the mosquito. 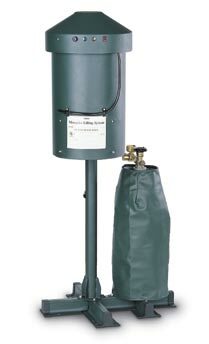 Unlike products that use propane or chemicals, the Mosquito Killing System is as environmentally friendly as having an additional tree in the yard, since it stores carbon dioxide and releases it back into the atmosphere. The system uses a standard 20-pound carbon dioxide tank—the same tank used throughout the beverage industry. Carbon dioxide provides a safe alternative to chemicals and pesticides found in competing products, because it is nonflammable, nonexplosive, and nontoxic. The system captures several times as many mosquitoes as any other machine or product, according to the manufacturer. The female mosquito—which feeds on blood from people, animals, and birds, unlike its male counterpart—lays an average of 300 eggs at a time. In essence, for every 1,000 female mosquitoes eliminated, the mosquito population is actually reduced by 300,000. Not only can consumers diminish the local mosquito population with the Mosquito Killing System, they can reduce the risk of various diseases vectored by mosquitoes and provide for a cleaner environment. In addition, the system will attract and eradicate other pests such as gnats, biting flies, and “no-see-ums,” but unlike conventional bug “zappers,” it will not draw the attention of beneficial insects that are good for the environment, such as pollinators and species that feed on plant-eating pests to help preserve gardens. Mosquito Killing System™ is a trademark of Arctic Products.